Tree & Garden Solutions Pty Ltd strives to offer our designs and expertise to suit to your vision of a beautiful home garden. Let our professionals give your garden the facelift it truly deserves. We believe every home should not be deprived of a beautiful garden. That’s why we are here to help get your garden in shape. We will work around your vision and come up with the best approach to meet your aesthetic desires and budget. If you want a place where you and your family can relax and enjoy, we can help. Our residential gardening services are fully catered to your taste and preference. Please contact us to discuss the options available for your garden and we will provide a free quote. Industrial grounds care requires breaking out the big toys. Heavy machinery and large equipment are commonly used in industrial gardening services so it’s important to have skilled professionals on the job. 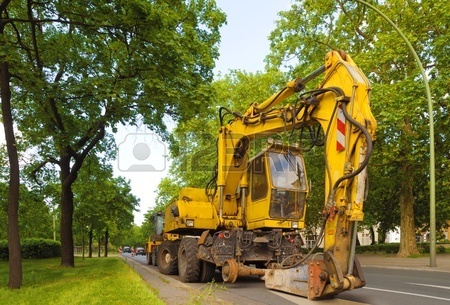 You don’t want just anyone driving a backhoe into a sticky situation on your site. When working on industrial gardening services the main concern is safety. No job is worth getting injured over. There are risks in performing grounds maintenance services and even greater risk performing these services in an industrial environment. Industrial environment work with large equipment, large volumes, and many people doing many different things. This requires a level of awareness to reduce the risks involved to people and property. Our first step in industrial grounds care is to perform a safety work assessment before the first shovel hits the dirt. These assessments help our crew become aware of what safety precautions should be put in place, ensuring that all workers and the environment remain safe. We reinforce our high standards of safety by also holding weekly safety trainings and meetings. The last thing anyone wants to see is an injury on the work site or a flaw in the plans.